Before we get started, I’d like to mention one quick thing about this subscription service that is a huge plus but I didn’t really realize until after receiving a few boxes. One thing I love about the Play! by Sephora box is that all items can be found at Sephora. I realize this sounds ridiculously obvious, but think about all of the subscription boxes that contain more indie brands, such as Ipsy. Now, I love my Ipsy bags, but when I want to purchase an item, I have to track it down, price it on various websites, and often pay shipping since that one product is under the minimal order price to receive free shipping. The Play! by Sephora box, on the other hand, allows me to find all of the items in one place, purchase as many as I like, and usually receive free shipping because their total adds up rather than being spread across various websites. Just something to consider if you’re trying to choose between various subscription boxes. 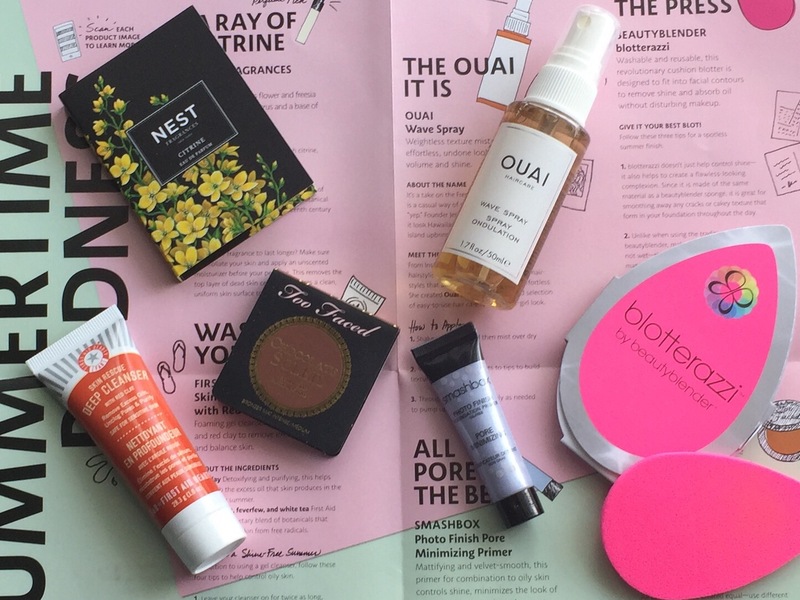 This month’s theme was “Effortless.” The box included a hair styling product, a facial cleanser, a face primer, a bronzer, and a blotter (I’m not sure of a good general name for this one), as well as the usual fragrance. All in all, it was a pretty good box. Not as good as next month’s (I’m behind due to travel, so I’ve been reviewing both boxes’ products at the same time) but a solid selection of high end products I’ve been wanting to try. This seems to be a theme with the Play! by Sephora boxes–they manage to include products I’ve a.) heard of before, and b.) have wanted to try. Well played, Sephora (pun intended). So let’s get started on the review! The first item was the Ouai Wave Spray. I’ve heard great things about this brand, and after trying this spray, I can see why. I use beach/sea salt/texturizing sprays often, typically to add body to my hair before pulling it into a messy bun. I had yet to find one that I can actually spray into damp or dry hair and then wear it down–most made my hair too stiff or crunchy, a la 1980’s hair mousse. (Ah, the perm. If only I could give advice to my middle-school self to skip that trend. But it was too powerful.) Anyway, this spray smells amazing–like a fresh shower after a day at the beach. I can’t describe it any other way. (I actually just sprayed it on my arm to try to pinpoint the smell, and now I can’t stop smelling my arm! It is just so refreshing!) You just spray it in your hair, scrunch, tousle, and go. It feels conditioning though this is not a claim it makes, and your hair just feels piece-y but soft and touchable. Would I purchase a full size? Absolutely, and I plan to. It retails for $26 for 5 oz. The sample size in the box is also available for sale, for $12, though this one is currently out of stock. And while I know I’ve said how much I love drugstore and affordable products, I will say that skin and hair products are where I’m likely to spend a bit more. I’ve found excellent drugstore shampoos and conditioners, but not nearly as many good styling products. So I’d be willing to splurge on this spray–it allows me to achieve an easy, effortless (there is this month’s theme!) look without having to spend hours following a YouTube tutorial to look like I rolled out of bed. Next, I received the First Aid Beauty Skin Rescue Deep Cleanser with Red Clay. I was first introduced to this brand when I received their Ultra Repair Cream in an Ipsy bag. I loved this hand cream, so I was excited to try the cleanser. It is a deep brick color, a gel formula, and smells, as all of their products do, of an old school pharmacy–that sort of minty medicinal smell that reminds me of my grandfather (and I mean this as a positive thing). Somehow when a product smells like medicine, I believe it is working. Probably First Aid Beauty’s goal. It works. This is a great cleanser, especially if you have oily skin–the clay is intended to absorb oil and help skin feel more balanced. Since I don’t have oily skin, I can’t really say whether or not this worked, but I will say that my skin did not feel dry after using it, as it often does with products meant for oily skin. Would I purchase a full size? Probably not, but only because I tend to look for hydrating cleansers, as my skin is a bit dry year round, and even worse in the winter. If you have oily skin, though, this might be a great option for you. It retails for $24 for 4.7 oz., and you don’t need much to get your skin clean. Just be warned that the scent is quite strong–I’d smell it in the store before buying if you’re sensitive to scents. 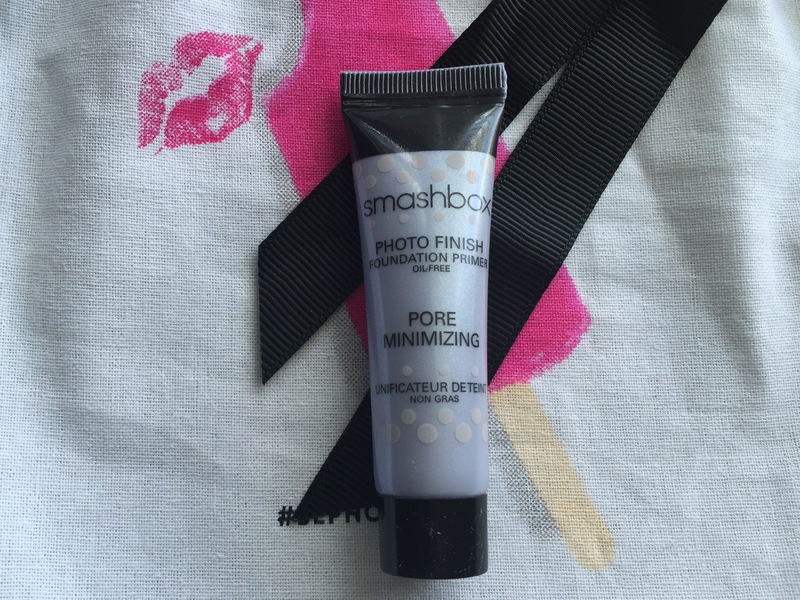 Next up: a Smashbox Photo Finish Oil-Free Pore Minimizing Primer. I’ve tried the original Smashbox Photo Finish Primer, the clear, silicone-based one. I really didn’t like it. As I’ve tried more primers, I’ve realized that with my dry skin, I really need hydrating primers, rather than silicone-based primers. These just make my skin feel oily and actually make my makeup slide off my face by day’s end. This primer was no different on me than the original–I used it around my nose and mouth, spots where I do tend to be a bit more oily, but it just didn’t work for me. Maybe it minimized pores, but I was so busy trying to keep my makeup from breaking down that I’m not really sure. At $39 for 1 oz, I definitely will not be purchasing a full size. Now, I know some people swear by these–maybe if you have oily skin this would work well for you. But if you have dry skin, I’d look for a more hydrating primer. Maybelline’s Master Prime Blur and Illuminate is this dry skinned girl’s gold standard. 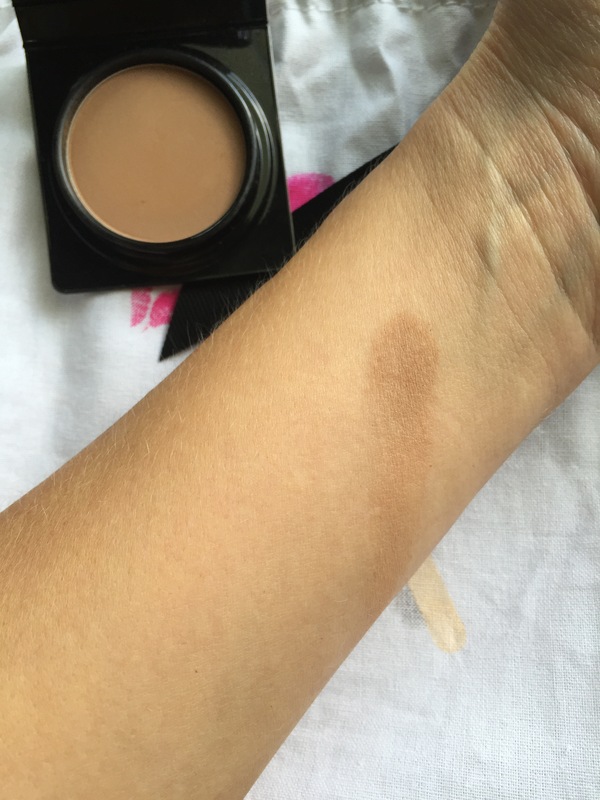 I also like the Becca Backlight Priming Filter if you want to look for a high-end option–it is creamy, sinks into the skin, and like the Maybelline, adds a beautiful glow. I just feel like the Smashbox Photo Finish Line is really intended for oily skin. 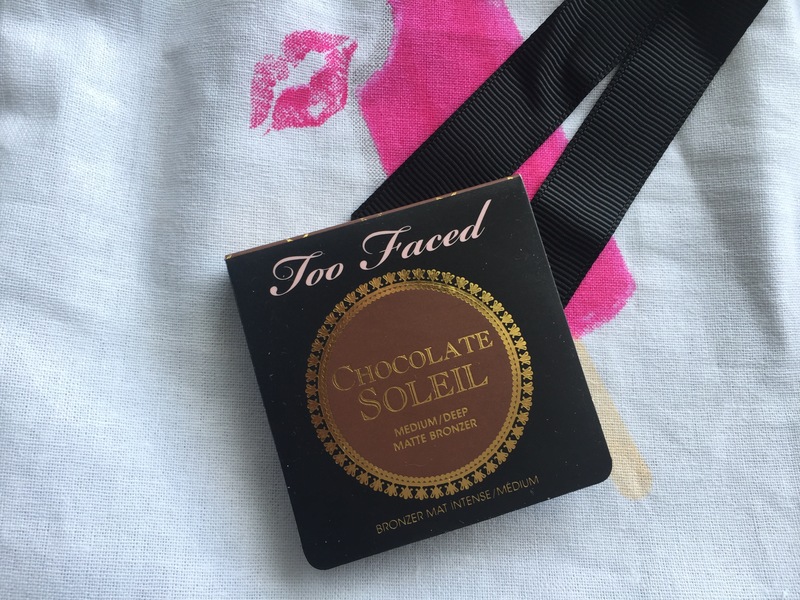 Next, the item I was most excited to see in the subscription box: the Too Faced Chocolate Soleil Bronzer. I hear about this everywhere: on YouTube, blogs, you name it. First, it smells every bit as amazing as you’d guess based on its name: not sweet, just like a rich, dark cocoa powder. It has a creamy, smooth, finely-milled texture. It glides on the skin like butter and blends so well. It is also matte, which I know many people prefer. I personally like matte and shimmer bronzers–it just depends on the occasion and what I’m doing with the rest of my face. Unfortunately, the color just does not work for me. I am at my tannest at this point in the year, but because I have such warm-toned skin, the cooler tones in this bronzer make me look a bit muddy and dirty. Would I purchase a full size? No, but only because it does not match my skin. The product works beautifully; it just doesn’t suit me right now. I would be willing to give the Chocolate Soleil Bronzer in Milk Chocolate a try, as this is intended for lighter skin tones and looks a bit warmer, at least online. I’ve heard a lot of people say the original Chocolate Soleil can double as a contour shade, which makes sense given its cooler undertones. I will hold on to it and try it again when my tan has faded to see how it works in that capacity. But it retails for $30, and I just have so many bronzers I already love at all price points, that I’m just not sure I’d need this one. The Physician’s Formula Butter Bronzer is an excellent bronzer for pale skin, and its heavenly coconut scent, combined with its creamy-smooth texture, really gives the Too Faced bronzers a run for their money. I might even go as far as to say the Physician’s Formula one is better. 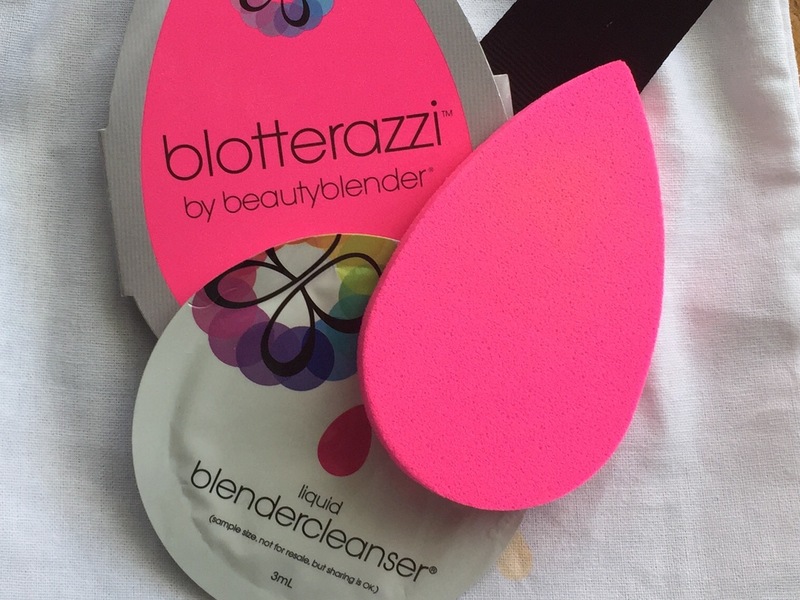 The final product in this month’s “Keep Oil Away”-themed box: The new beautyblender Blotterazzi, or oil blotting sponge. I’m just going to go ahead and say that I don’t get this one. What was wrong with blotting papers, exactly? This just seems kind of gross–you blot oil, then save the sponge to use again? The sponge does come with a sample of the beautyblender blendercleanser, but the full size product (which retails for $20!) does not. The full size does come with a mirrored compact to hold the sponger, which would keep it from getting dirty in your bag, but this still does not solve the problem of the fact that you are blotting your face with a sponge that will become soaked in oil. I mean, how many of us are really as diligent as we should be about washing our makeup brushes? Be honest now. Do we really think this would be any different? If you don’t want to mess with traditional blotting papers, or if you like the idea of a mirrored compact, go for Elf’s Mattifying Blotting Papers, which are $5 and come with a compact and a little sticky sponge that prevents you from having to touch the actual paper. In case you’re wondering, I did try the blotterazzi a few times. Yes, it does soak up oil. But it does not do a better job than any blotting papers I own, or have ever owned. So no, I would not buy this one. Not at all. I love a nice citrus fragrance, and this one is a welcome addition to my collection. 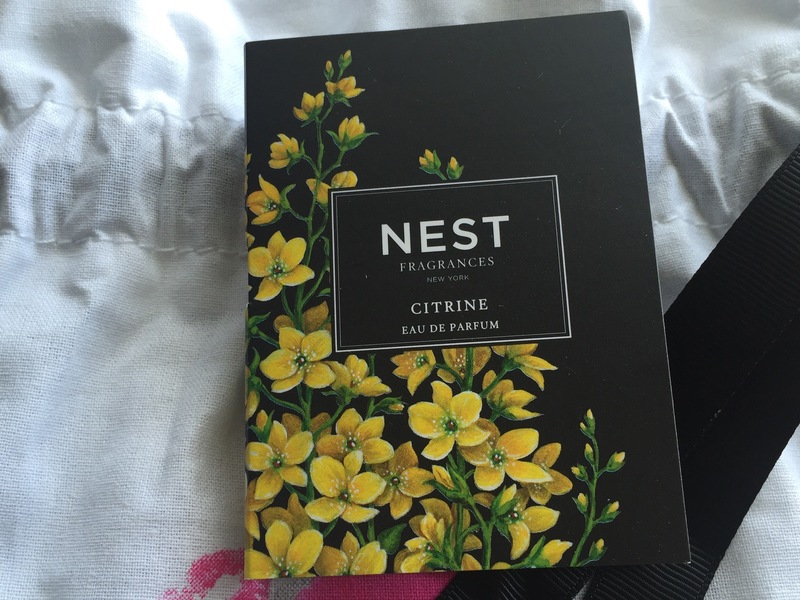 The Nest Citrine fragrance is floral and citrusy, and just smells like spring. According to the card in the Play! by Sephora box, it has notes of lotus flower and freesia, and while I tend to prefer a scent with a bit more spice for fall and winter, this is not so reminiscent of spring/summer that I can’t wear it into fall. A 1.7 oz eau de parfum spray retails for $68, but I’d be more likely to buy this in the .27 oz. rollerball format, which retails for $25. It would be great to have in my bag to use throughout the day, as it smells clean and fresh, rather than perfume-y. Final Word: Overall, I really enjoyed this bag. 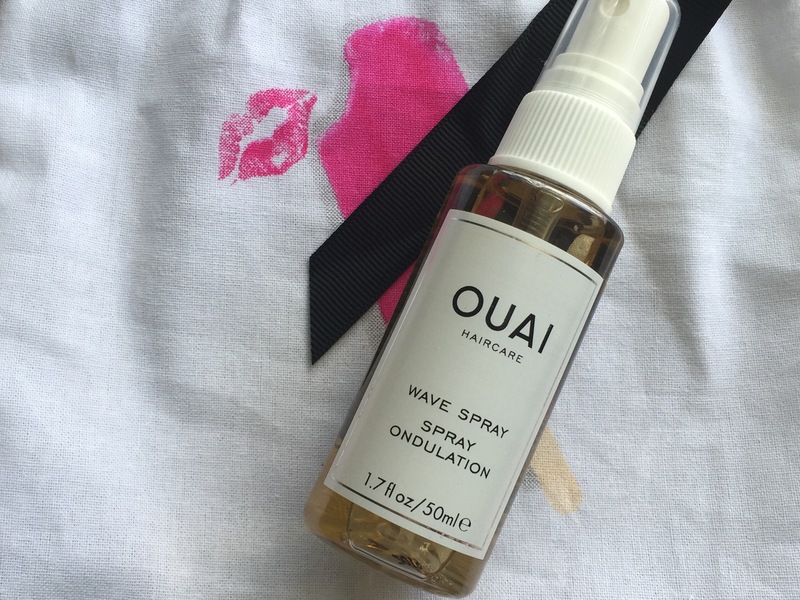 I plan to purchase the Ouai Wave Spray for sure, and I will keep this fragrance at the top of my list come spring. While I don’t plan to purchase many of the other products, I will enjoy using the samples. And I’ll be sure to update you if I do try out the Milk Chocolate Bronzer or if I find a way to use the Smashbox primer on dry skin.